Tell me if I get this right. You thought growing traffic on your blog meant mastering SEO. Or being a writing genius. Or blogging about only food and finance. I did. You see this sharp little pin in my hand? (Pretend there’s a pin.) I’m about to burst your bubble with it. But you already knew that, didn’t you? Here’s the thing. I’m a new blogger. Four months along, actually. And I didn’t know anyone or anything when I first started. That didn’t stop me from growing this site to 1k daily visitors in those few short months though. Are there bloggers out there with a bigger following? Yep. Did some of them grow faster than this site did? Probably. That’s because there’s still a lot I have to learn about writing for the online crowd. But I didn’t want to wait till that day—when I’d mastered SEO and knew all the top bloggers—before sharing my work with tons of readers. So I got clever. Part of my success was research. Part of it was luck. Part of it was looking at my options and maximizing what I had the second I had it. That’s how I found the techniques I’m sharing with you here. But first, I shared these traffic-boosting tips with my fellow blogger, Adrian. This Blogger’s Great Content Wasn’t Converting Readers. Are You Making The Same Mistakes? Meet Adrian. She blogs at Adrian’s Crazy Life where she shares product reviews and money-saving tips. I met her through a Sitsgirls linkup in December. Adrian mentioned in a comment on my Pinterest for Writers infographic that her Pinterest marketing efforts weren’t kicking back traffic the way it does for DIY and food bloggers. She speculated that her post’s poor performance on Pinterest might be due to their text-heavy format. It’s a fair assumption. Pinterest is about images. So are DIY and food blog posts. Seems like the match of the ages, right? Except my posts are text-heavy too. And they still kill on Pinterest. I knew there must be a disconnect somewhere. My suspicion? Adrian’s photos were probably to blame. It isn’t Adrian’s fault. Nobody tells you this stuff. So I clicked on her site for a closer look. Nope, the problem wasn’t her posts. Adrian writes well. She has interesting things to say and offers valuable insights to her readers. So what was the problem? No one is clicking through to see how great the posts are. And there’s a reason for that. Adrian’s headline photos left more than a little room for improvement. With Adrian’s brave permission, I share the tips I gave her below so you can raise your traffic too. The ideal image size on Pinterest is 735×1102 pixels. That means your images should be vertical, or longer than they are wide. These dimensions look amazing in the Pinterest feed, prevent overcrowded text, and are small enough to prevent the forced extra click that expands too-long images on Pinterest. Here’s what that looks like in action. Try cropping your headline images to this pixel size, and see where it gets you. Adrian’s posts have excellent tips with actionable advice. The headlines don’t do them justice. Which means potential readers miss out on quality articles that Adrian and bloggers like her put a lot of work into. If you’re working this hard, you deserve more traffic. And the way to get that is writing headlines that arrest attention. Some of Adrian’s headline images are fuzzy and dull. The kicker is, quality and copyright-free images are easy to come by these days. That means you don’t have to waste time building photography skills or waste your cash on boring stock photography. Not when so many great photographers give away their work for free. Cropping your images for that perfect 735×1102 pixel size is a lot easier using free online software. Many of them even have overlays and fonts you can play with for attention-getting images. Canva does the job simply and for free. Group boards are amazing platforms for new bloggers. They have a built-in audience grouped around a common interest. So find a few group boards with interests you write about and share your work with them. It’s instant access to an audience, even before you’ve built your own following. Don’t wait for an invitation. Just ask for one in the comments of a pin. Or send a message to the group board owner. Just be sure to follow the owner or the board first. Pinterest doesn’t allow messages or board invitations between pinners who don’t follow each other. Bordered images just don’t look nice on Pinterest. Adrian made this stylistic choice that may look fine on a blog post. But if she wants more traffic from Pinterest, she’s got to ditch the borders. Why? Pinterest is all about the visual. The majority of clicks and pins come from pretty images. Borders obscure viewability, break up the attractive harmony in the Pinterest feed, and steal prime real estate from your headline text. Just say no to borders. Adrian got a lot right too. Here’s what you should copy. 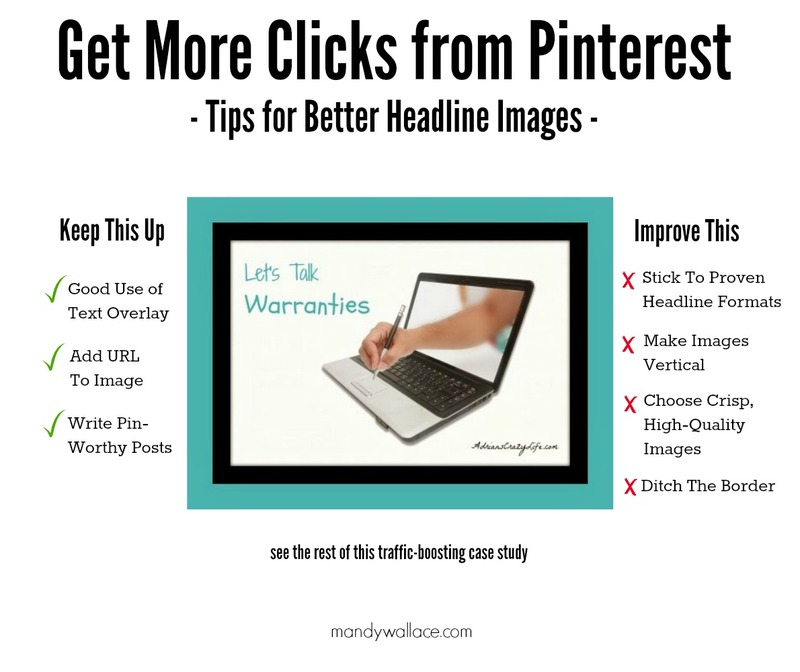 Add a headline or teaser to the photo that tells Pinterest users what they’ll get when they click. Adrian’s got this pegged. Adding a URL to the photo tells Pinterest users where to find the article, even if the link gets lost or damaged. Hey, it happens. But that doesn’t mean you should lose traffic, right? So add your URL to your photo like Adrian did. Most of this post is about how to get Pinterest scrollers to click through your image to your article. But getting the repin means writing the kind of content your readers want to save. Why is this important? Everything a Pinterest pinner pins (say that five times fast!) winds up in their follower’s news feeds. Which means every repin is a chance for hundreds more pinners to see your post. That’s how things go viral, baby. And that’s exactly what happened to my articles How A Broke College Student Saw Europe and The Character Most Writers Get Wrong (And How To Fix It). Both hit the 50k pin range because of the methods here. And it will happen to you too if you follow these tips. Adrian’s getting this right. Are you? May I be so bold as to ask you to take a look at my blog? And maybe tell me what I’m doing wrong? Hey, thanks for asking 🙂 I had a look at your blog, and I can see you’ve put a lot of good hard work into it. I would say to give the tips in this post a try. The headline templates alone will help you focus your posts into something your readers can use to improve some aspect of their lives. And the photo tips here will help you boost visual appeal. That’s enough to get started with. Then if you have questions after that, feel free to ask them. You can reach me on the contacts page of this site. Thanks for reading. Hope it helps you raise your traffic. Thank you for the amazing advice! You hit all the questions swimming around in my head in one post!